Did you catch that in the title? 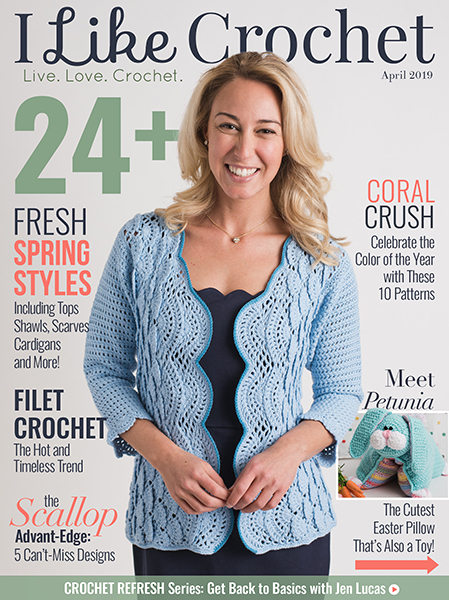 Furls Odyssey Crochet SET Giveaway… that’s right, the entire set! What what? That’s 10 hooks, the holder, *and* the yarn bowl! 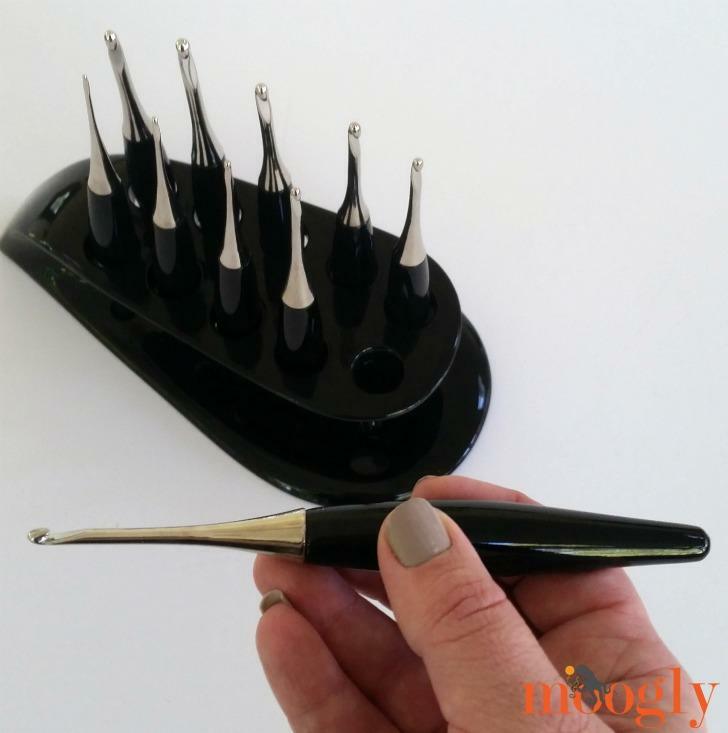 All being given away to one super lucky winner here on Moogly! STATE-OF-THE-ART CONSTRUCTION: The Odyssey’s nickel-plated pewter neck is chrome-smooth, making for easy stitches and great crocheting speed. IMPROVED CROCHET MECHANICS: The Odyssey’s unique center of balance creates a weight differential, driving hand energy into crocheting momentum rather than hand strain. MADE FOR THE HUMAN HAND: A new streamlined shape is extremely comfortable and relieves acute tension in knuckles, hands, and wrists. 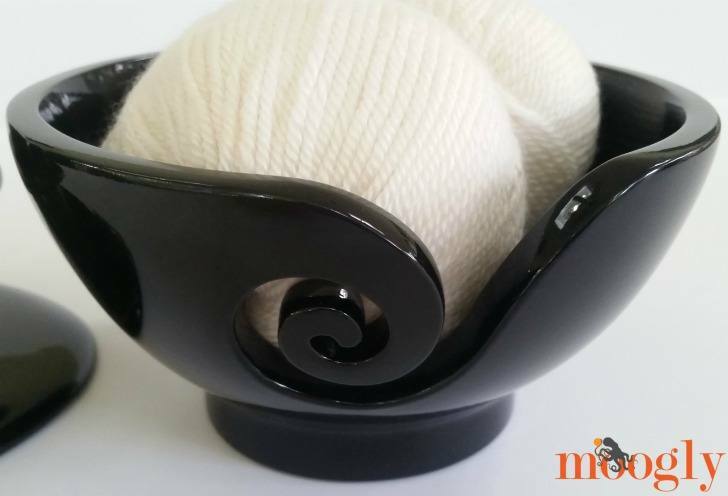 This same sleek look extends to the holder and yarn bowl, which are the same cool material as the hook handles. I love that the holder keeps my hooks in order, so I can always grab the right size. And the smooth finish of the bowl won’t snag even the fuzziest of yarn! The Furls Odyssey set is like a set of jewels on your shelf, and in your hand. You can order Furls Odyssey hooks in your favorite sizes if you CLICK HERE – and remember, every Furls hook carries their 100% money back guarantee if you’re not satisfied! The only risk is starting a new hook addiction… There are even the special discount codes below! All the coupon codes expire 11/04. Limit 1 per customer, and they cannot be combined. My own Furls Odyssey set stays with me – I was so happy to get the set to review! But Furls is also giving away the entire set – 10 hooks, the stand, and the bowl to one incredibly lucky winner! That’s a $500 value!! Enter the giveaway below for your chance to win! 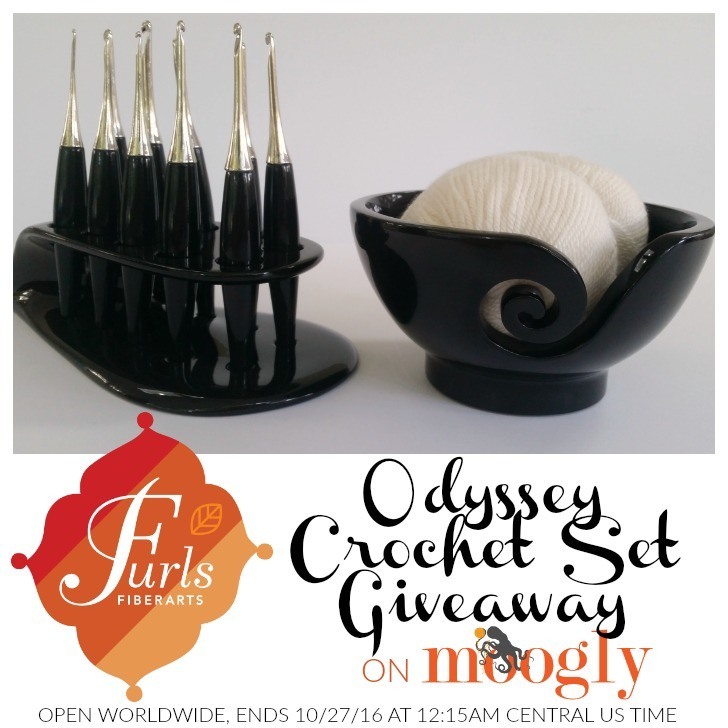 The Furls Odyssey Crochet Set Giveaway on Moogly is open worldwide and ends 10/27/16 at 12:15am Central US time. To enter, use the Rafflecopter form below. If you are on mobile and have difficulty entering, please use a desktop computer to enter. Only the email option is mandatory – all other tasks are optional, for bonus entries only. 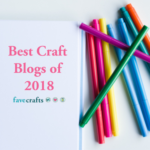 Get Moogly on your favorite social media sites: Facebook, Twitter, G+, Pinterest, Instagram and Tumblr, and sign up for the free Newsletter so you don’t miss a thing! 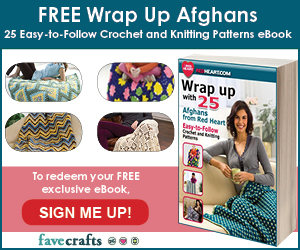 Thank you to Furls Fiberarts for sponsoring this giveaway! Done. Done. and Done! Hope I win and thanks for the chance at such an awesome giveaway! The handles are completely rounded. All done, wish me luck! I can’t enter you, but please look for the Rafflecopter widget. The site gets busy sometimes, so you may need to refresh the page. You have my very long request to win the Contest, never seen Hooks like that before !! SURE WOULD LIKE TO WIN AN SET FOR MY SELF !!!!!?????!!!!! Those are so beautiful; I don’t know if I could bring myself to use them or if I’d just want to display them like the pieces of art that they are. Would love to give this to my bestie for xmas – she raves about your products! These hooks are absolutely gorgeous! Ca y est Partagé sur tout ce que je pouvais, et hâte de voir le résultat, je n’ai pas beaucoup de chance au jeu, mais un cadeau pareil, je ne peux pas résister !!! Cette collection (comme toutes les autres) est magnifique ! Merci encore pour cette proposition de jeu ! I hope I win my hooks aren’t very good I need the ergonomic ones because of arthritis. This set is ? lovely! I have loom knitted for years, just recently starting to crochet. I would love this set! Thanks for the giveaway. What I wouldn’t do for a set of these marvelous hooks! This is the most exciting giveaway I’ve seen in years!! A awesome birthday present to win! Thank you! Done. Would love to win this. Thanks for the opportunity! It would be really awesome to win this set. Wow! Beautiful set! Thanks for the chance to win! What a incredible prize. Good luck to all. Dream of owning a Furl’s created hook. This is really exciting. Hope to win them. Wow, this is an amazing giveaway! I hop I win, I hope I win. What an awesome prize thanks Moogly and Furls, excitement plus. If I win I’m giving this to myself for my birthday! Done! What sleek, gorgeous hooks! The bowl is divine! I can’t buy anything like these in Australia. On the off chance that I don’t win, I may have to ask Santa for a set. This would make an awesome birthday present for me! Thanks for the chance to win. Such a LOVELY giveaway. Good luck to all. This is so awesome! Crossing all my fingers and toes! This is an awesome giveaway! Entered and visited Furls, don’t tweet! Thanks for the opportunity!!! So enjoy Moogly here down ujnder. Thankyou for so many wonderful patterns. I would love to try these hooks. This would be a beautiful set of crochet hooks to own. Wow, what a fantastic giveaway!! I have entered for the opportunity to win and have visited the Furls site. 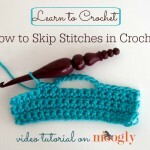 The Furls crochet hooks are beyond compare. I would be so pleased to own an entire set. Thank you so much for this opportunity. Good luck to all who enter. I’m a bit of a hook-a-holic but haven’t tried these ones. They look awesome so I have fingers crossed to win. Thanks for the opportunity. Oh be still, my heart!!! This set is beyond gorgeous. What a fabulous and generous giveaway. Thanks for the chance, Tamara & Furls! Good luck, everyone. Wow, what a prize! 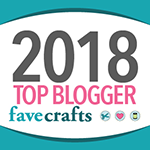 Good luck everyone and thanks Mooglyblog & Furls! I love the two Furls Odyssey hooks I purchased for myself. One day I will finish my set. wHAT A WIN THIS WOULD BE .. lOVE IT !! I’ve put my name in! I’m hopeful to win but I’m not the luckiest person lol. I love this site. 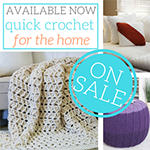 I come here for my crochet needs all the time. What an amazing giveaway. I have been drooling over these hooks for a while but I could never afford them. Excited to get a chance to win them! Good luck everyone! I really Hope I Win. Hugs from Denmark. 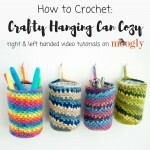 I purchased one of the Odyssey hooks because I am doing a lot of sweaters for the neonatal unit and I thought it would help with the hand fatigue. It really was such an aid and more sizes with which to work would be spectacular! Trying to access the Moogly Special ‘buy all 10 hooks and get 1 accessory free,’ but it won’t open! Will this offer still be good after the Giveaway? Yes, thanks, I kind of figured that out and went to Furls website. I have the hooks on my wishlist but so hoping to win, I haven’t placed the order yet. So excited about this give-a-way. One can never have too many hooks, projects, yarn! I love your site. I have made many of your patterns. Thank you so much. I don’t use Twitter either — thanks for the opportunity to win a wonderful set of hooks !! Prachtig, zou ze zeker ook dolgraag winnen. Als ik ze gewoon wil kopen komen er nog zoveel verzendingskosten bij dat ik het me niet kan permitteren . Dus duimen maar dat ik het goed gedaan heb . 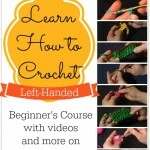 I dream of being able to use these crochet hooks. They are the most beautiful crochet hooks I have ever seen to win this whole set would be over the moon. Thank you for giving me a chanc to win them. I have a question on Tunisian crochet lap blacket, After finishing the blacket i noticed width of the blacket when i started does not match the end of the blacket!!! There is about 3″ going in an angle?!! Hoe do I block it? Will the blocking it make it both end match? 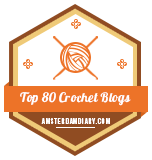 I have the same number of stitches in every row! Even then it was went in an angle! It sounds like it was a tension issue. 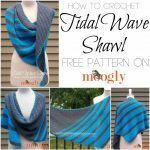 Blocking may help some – it’s worth a try anyway! I love these hooks. I have three, and if I won I’d … keep the extras, just in case! Thanks, Tamara, for the chance! So completely gorgeous! I’m envious of anyone who gets to use such a beautiful set. Anything made with Furl hooks is automatically fantastic – coming off those hooks a project wouldn’t dare be anything but fabulous! yo los quiero son simplemente hermosos…. me encantan. Done, done. Would love to have a set of hooks.